One does not often meet red-bellied lemurs (Eulemur rubriventer) in Madagascar, but they play an important role in the rainforest’s fragile ecosystem. Only male wear the eponymic red belly, females are white or cream colored on chest and belly. Males also have white fur below their eyes which lacks in females. 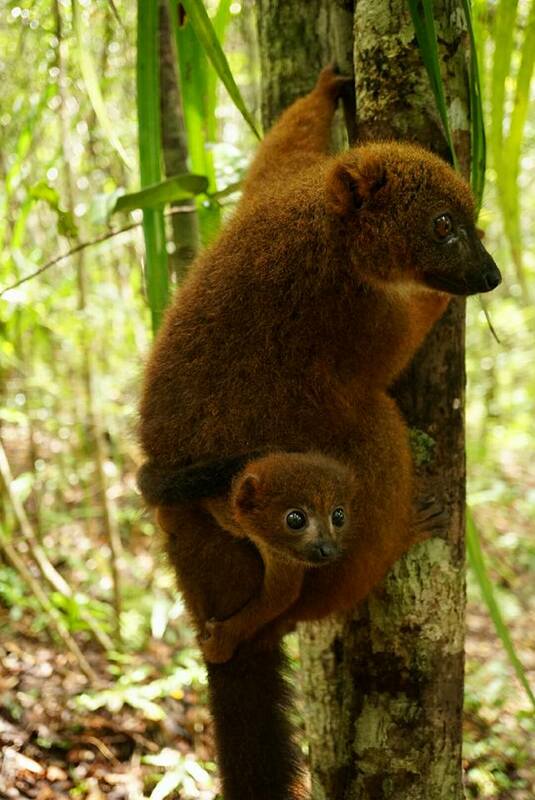 At average, red-bellied lemurs weigh one and a half to three kilos and can become up to 25 years old. 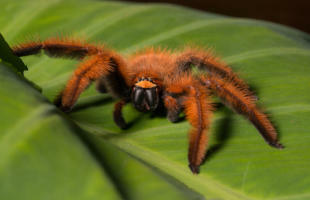 Their natural habitat is rainforest along the eastcoast. But red-bellied lemurs only occur in isolated forest fragments along a small stripe and not continuously all over the eastcoast. Their northernmost distribution area are Tsaratanana massif and Marojejy national park. 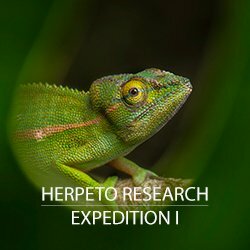 In the central highlands, you can find them in Zahamena, Mantadia and Ranomafana national parks. 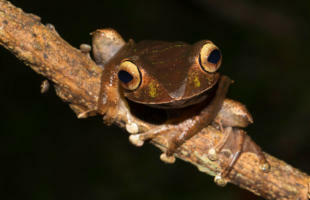 Akanin’ny Nofy reserve has settled them successfully nearby Toamasina. 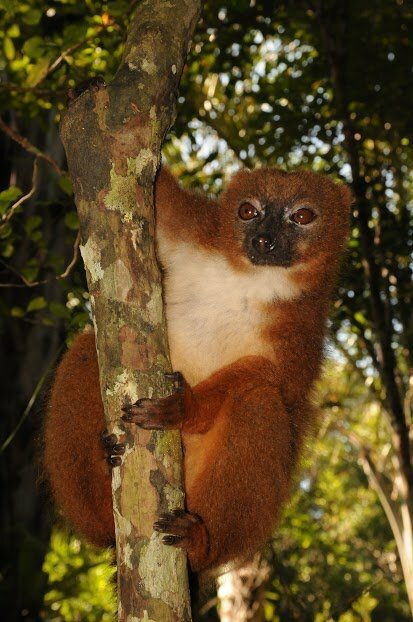 In southern direction, red-bellied lemurs occur until Andringitra national park. Scientists assume their distribution to have reached more south earlier. Red-bellied lemurs live in family units from two to ten individuals. Mostly it is a pair and its offspring of various ages. They are strictly monogamous – pairs live together their whole life. Each family lives in a relatively small territory of approximately 0,2 km². Males mark the territories’ borders with their forehead glands, and thus set clear signs for other red-bellied lemurs: Stay out of here! The beginning of dry season is mating season for red-bellied lemurs. After a gestation period of four months, each female bears only one young – it is born just before rainy season. With rainy season, the season richest in fruits begins on the red island, providing best rearing conditions for young lemurs. Nevertheless, only 50% of the young survive. The first weeks, only the mother cares for her young which clings to the fur of her belly. Afterwards, the father becomes important until the young does its first independent journeys through the trees. This fatherly concern is rather rare among lemurs. Weaning occurs between five and seven months. It takes two more years until the young lemur becomes sexually mature. 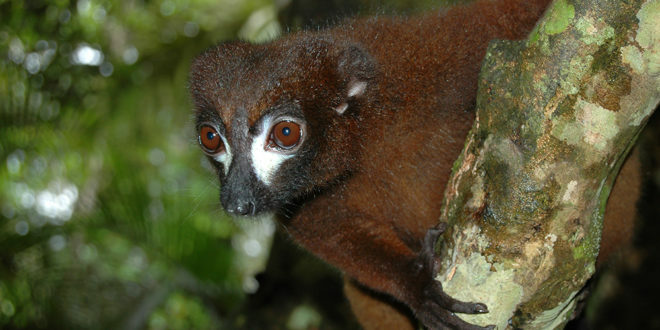 Red-bellied lemurs are famous for their special role in the rainforest. They serve as kind of gardeners of the forests by dispersing seeds of many plant species. Well, many lemurs prefer feeding on fruits as well, but only red-bellied lemurs swallow most seeds as a whole so they pass their digestive tract undamaged and are eliminated with a good portion of dung. 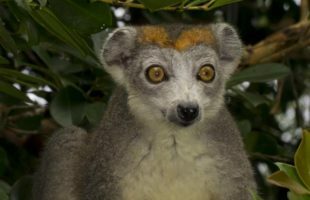 About 70 different plant species are part of the lemurs’ diet. Outside rainy season, they also eat nuts and leaves. They even adapted to the introduced guava that occur in many places of the eastcoast. A millipede once in a while also makes a nice meal, but the lemurs first put a lot of saliva before eating these. Scientists speculate saliva could reduce the effects of toxic defense secretion of the millipedes. Further more, red-bellied lemurs pollinate a lot of flowers. They often only lick the nectar and do not destroy the whole flower, visiting several different flowers a day. Sometimes you can even see pollen in the lemurs’ faces. Red-bellied lemurs even have a specially brush shaped tongue that cannot be seen in other lemurs. As small gardeners, red-bellied lemurs climb all over the tree – even upside down – , also leaping on the ground. 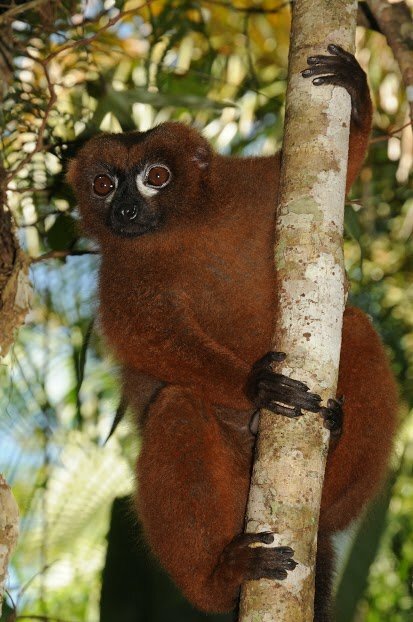 Families of red-bellied lemurs usually deploy a sentinel. He eats later and warns his family when predators such as the Fossa or large birds of prey arrive at the scene. The deep grunt of the sentinel makes the other family members seek shelter or freeze for minutes without movements until danger has passed. 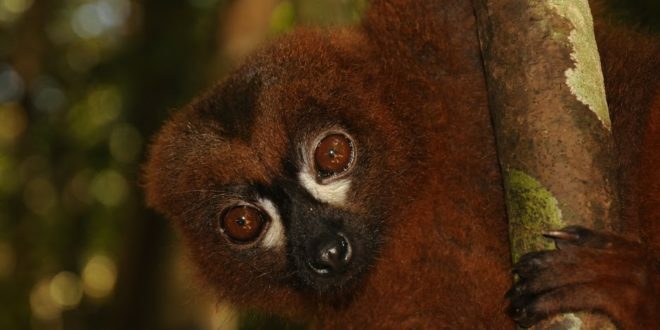 Red-bellied lemurs are hunted for bush meat in Madagascar. 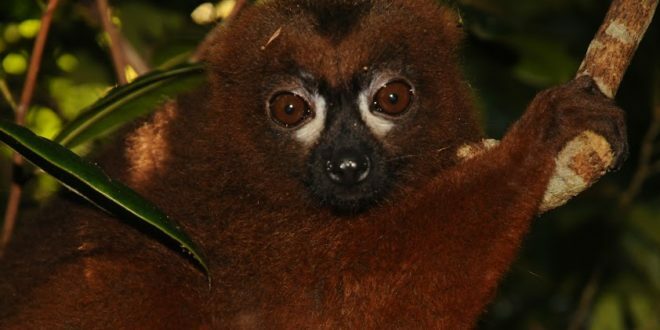 Beside red-fronted lemurs, they rank among the most eaten lemurs of the country. This might also be caused by their curious and tame behavior: In many places, they approach humans until few meters. This might be great for travelers and photographers, but also brings the animals in danger being easier to poach. 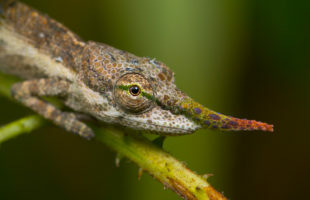 On the red list of threatened species by IUCN, red-bellied lemurs are listed as “vulnerable” since population has decreased more than 30% during the last 25 years. Apart from hunting pressure, slash-and-burn agriculture and illegal logging are main reasons for species decrease. Yet scientists assume that red-bellied lemurs will not disappear from the island within the next decades due to their existence in many protected areas. A good prospect for the gardeners of the forest!